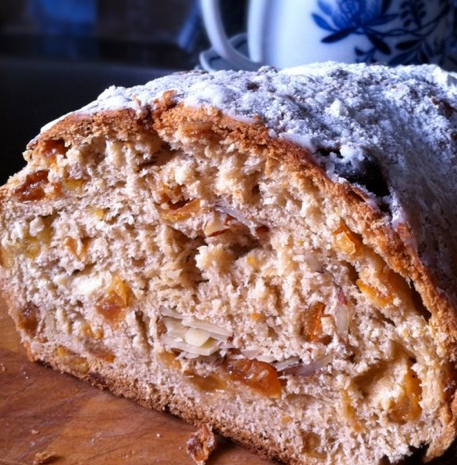 There’s no time like Easter for Christmas Stollen I always say. My mom always makes a Czech Easter bread for the holiday called velikonoční bochánek and so I thought I would try a different festive fruit bread. 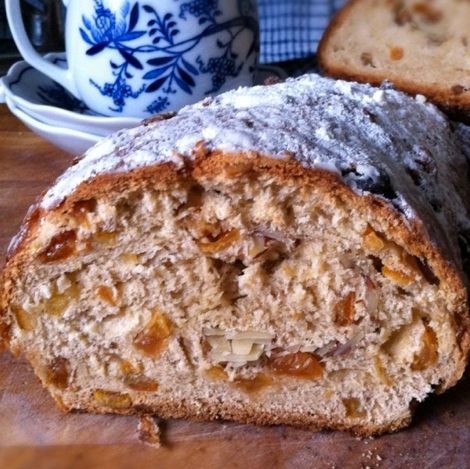 What I discovered just this year (post Stollen making) is that the bochánek is actually the same bread as the Christmas vanocka–just a different shape! 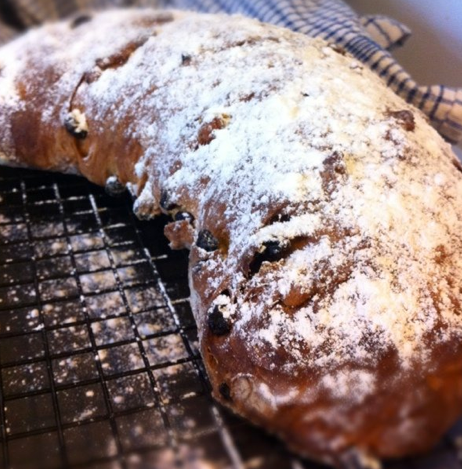 So can you really blame me for making Christmas stollen in the Spring? One size fits all holiday breads are in my blood. Luckily, all’s well that ends in rum-infused fruit bread. I took my recipe from the The Bread Baker’s Apprentice. 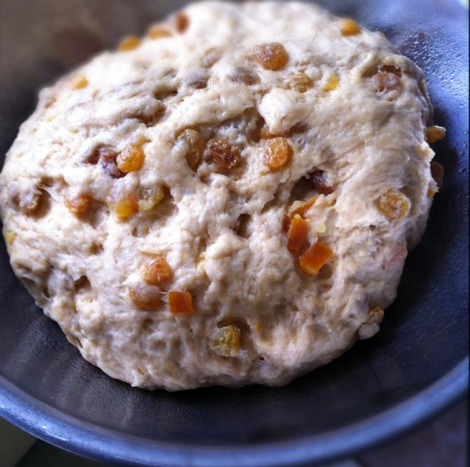 (p252) After much grumbling, this apprentice realized that the only right thing to do was to candy my own oranges to make a pure Easter stollen. So we’ll start there. 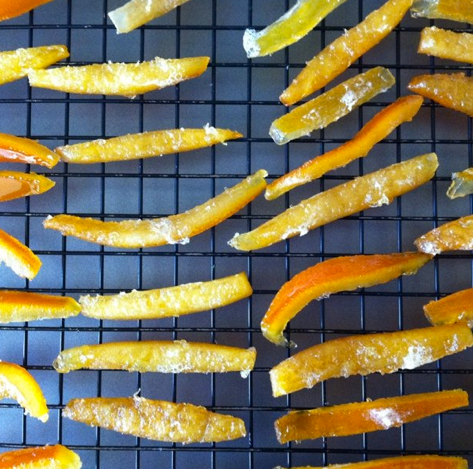 Truth be told, candying citrus peels is one of those things that seem like a monumental pain (like laundry) but then you realize “Hey, I’m not washing clothes on a washboard in the river one garment at a time, I have a washing machine with steam setting.” Essentially you peel your oranges, pith on, slice them into strips and then boil them for 3 minutes and drain (repeated 3 x) to remove their bitterness. Then you melt sugar and water over medium heat (1 1/2 :1 ratio) essentially making simple syrup. Add your orange peel and wipe down the sides of the pot to flush off any undissolved sugar crystals to avoid crystallization later on. Bring to a boil and then reduce to a simmer for about 1 1/2 hr or until the syrup has reduced to a quarter of the original quantity. I put these on a rack to dry a bit before I diced them. This is the point you could also roll them in sugar and dip them in chocolate, or store them in their syrup to use later. 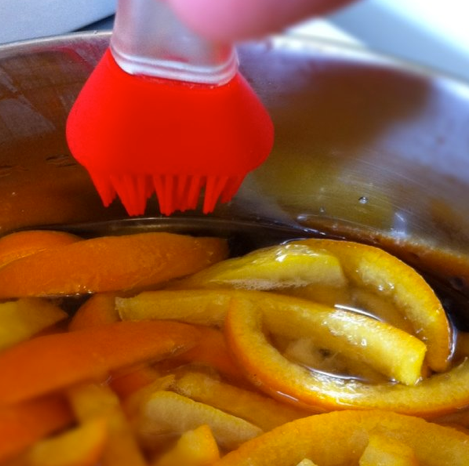 (You can use the syrup to sweeten drinks or pour on fruit). 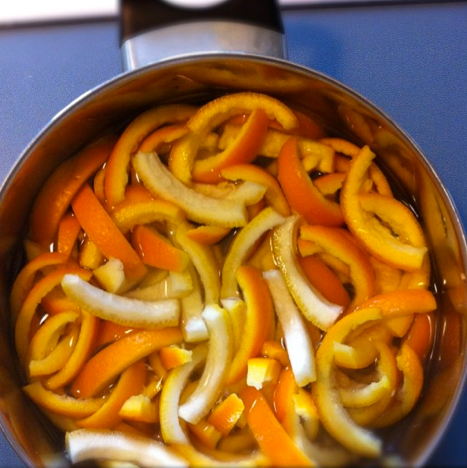 Candied orange and raisins soaking up a little Cointreau. 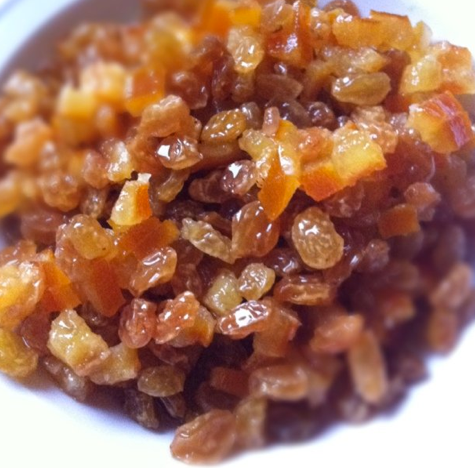 Take 1 cup raisins and one cup of the diced, candied citrus and soak overnight in brandy, rum or schnapps. I had Cointreau so I used that and eliminated the addition of citrus extract. Next you make the sponge which will leaven the dough. A simple combo of whole milk, AP flour and instant yeast. I didn’t have whole milk so used 2% and a little bit of cream. The sponge after fermenting about 30 minutes. When the sponge is ready, you mix together the dry: flour, sugar, salt, orange and lemon zest and cinnamon. 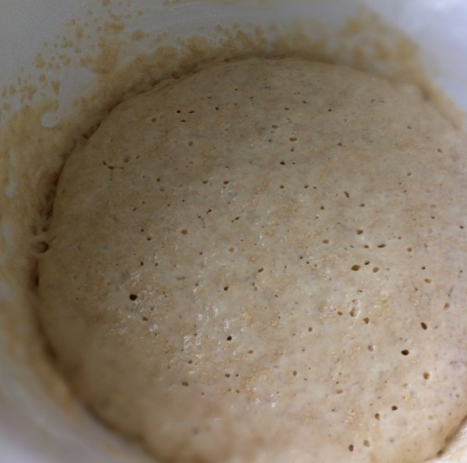 You then cover the dough in a lightly greased bowl and let it sit for about 45 minutes to rise. 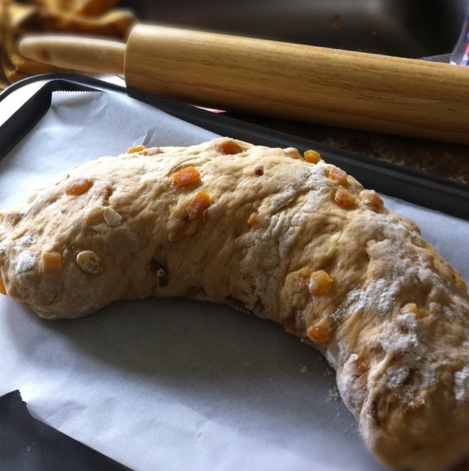 Then you can use one of two methods to form the stollen. The method that looks cooler (and more like the blanket swaddled baby Jesus which the bread is meant to represent) or the easier loaf method which causes less cursing (and who wants to curse an edible baby Jesus) which was my choice. 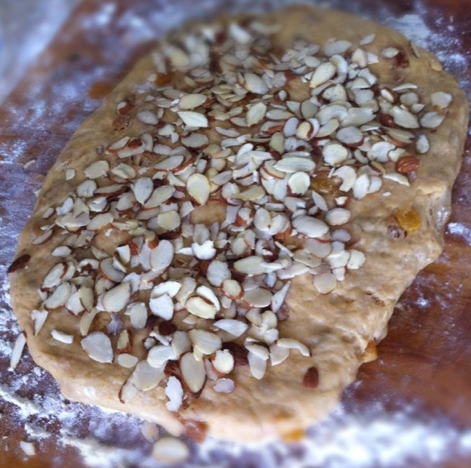 For either method you flatten the dough into a rough rectangle and cover with sliced almonds and extra fruit. You can also replace the almonds a layer of marzipan which I would do next time–I think it would add a nice moist core. 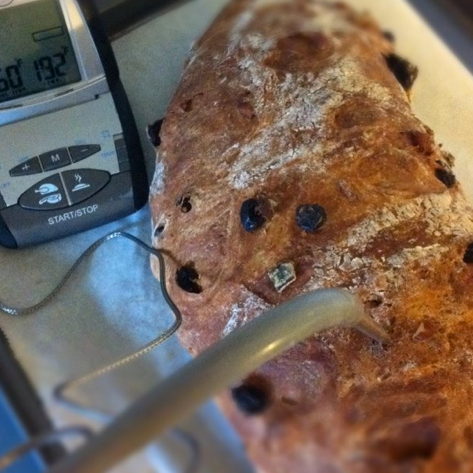 Then you let the stollen proof for about an hour. And finally you bake at 350 F. I baked it about 55 minutes (you can make two small loaves but I did one large) until the internal temperature was 190 F. (hey, I wanted to get this sucker right!). But in hindsight I would have probably taken it out sooner knowing it will still bake a little before it cools. While it’s still warm, you brush the bread with oil and then cover with a sieve of icing sugar. Repeat again. Voila! Can I shake the sugar or what. And then eat! Lovely with a cup of tea. Apparently the Germans like to let the stollen sit out and dry up a bit. But maybe that was just an accident once upon a Christmas and they don’t want to admit it and now it’s a bad, bad tradition. Or maybe they just like an excuse to “Dunk”.